Jeanne Scott’s great love of Hamilton and her desire to help others are nourished through her fund at Hamilton Community Foundation. Jeanne Scott learned many lessons from her mentor, the late Dan Giannini; for her, giving back to your community has been the most rewarding. For almost 50 years, Jeanne worked as Dan’s assistant in the financial services industry. As new immigrants from England, Jeanne’s and her husband’s early years in Canada were not easy, and the opportunity to cash in an unexpected $1,000 accumulated sick benefit seemed like a windfall. “Dan convinced me to let him invest it,” says Jeanne. “I was reluctant. It was more money than I had ever had, but I had faith in him.” Dan began to show her how to manage her investments and, as a savvy businessperson in her own right, Jeanne followed his example and watched other advisors they worked with. She also began to follow Dan’s lead in donating to local charities – including HCF. “I would attend meetings with him at the Foundation,” she says. “I liked what they were doing and the way they did it. 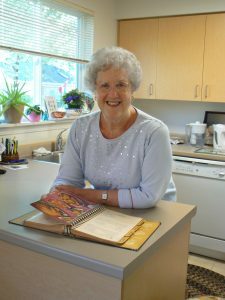 Jeanne established a designated fund at HCF with gifts of shares, supporting the Good Shepherd Centre where she is a long-time volunteer, and the HCF Community Fund, recognizing her great love of the city. As a classically trained singer and performer, she also supports a bursary award for performing arts students through her fund.